Auditions for singers, dancers, and musicians interested in becoming members of the Burning Hills Singers and Coal Diggers Band will be held at the dates and times below. Members of the media are welcome at audition venues. Representatives from StageWest Entertainment and the Theodore Roosevelt Medora Foundation, as well as auditionees, may be available for questions and comments. Bismarck, ND at the Lynne Center Good Shepherd Lutheran Church, at 10 a.m.
Fargo, ND, at the Howard Rehearsal Hall within the Hvidsten Hall of Music, Concordia College, at 1:00 p.m.
*All auditions except UPTA are first come, first serve. 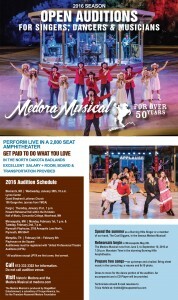 The professional cast of each season’s Medora Musical hails from all across the nation – with talented members of the cast often coming from the Show’s home state, North Dakota. Over the 51-year history of the show, many cast members have gone on to very successful performance careers. 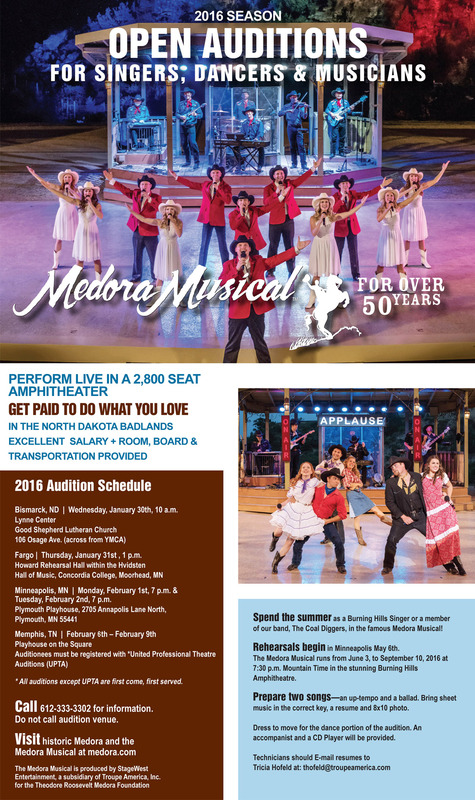 Two Medora Musical veterans who’ve enjoyed recent success include, Jared Mason (Lillis), star of the Tony-award-winning Broadway Musical, Million Dollar Quartet, and, of course, Kat Perkins, who took the nation by storm during her time on NBC’s The Voice.